I get excited when I have a reason to make a cake, but you don’t really need a reason to bake a cake—do you? This recipe inspiration came from Donna, who asked about yellow cake on the Comfy Belly Facebook page. I’ve been meaning to get a basic yellow cake recipe together, so thank you, Donna, for moving me along on this one. Cakes are a labor of love, and this recipe will take some of the labor out of making a yellow cake with almond flour. And note the technique I use for easily getting the cake out of the pan. I cut out a piece of parchment paper and place it on the bottom of the cake pan before pouring the batter in to bake. This recipe is based on my fluffy cupcake recipe. While modifying the cupcake recipe to use as a cake recipe, each time I added more honey to the batter to make it sweeter the finished cake became softer and a little more difficult to frost at room temperature. So if you’d like the cake sweeter, you can add up to 4 tablespoons of honey and the cake will still be firm, but it will get a bit more challenging to frost as you increase the amount of honey beyond 4 tablespoons. I haven’t tried agave nectar or maple syrup, but if you do, let us know how it turns out. This recipe makes one layer of cake so to make a two layer cake just double the recipe and split the batter between 2 cake pans. 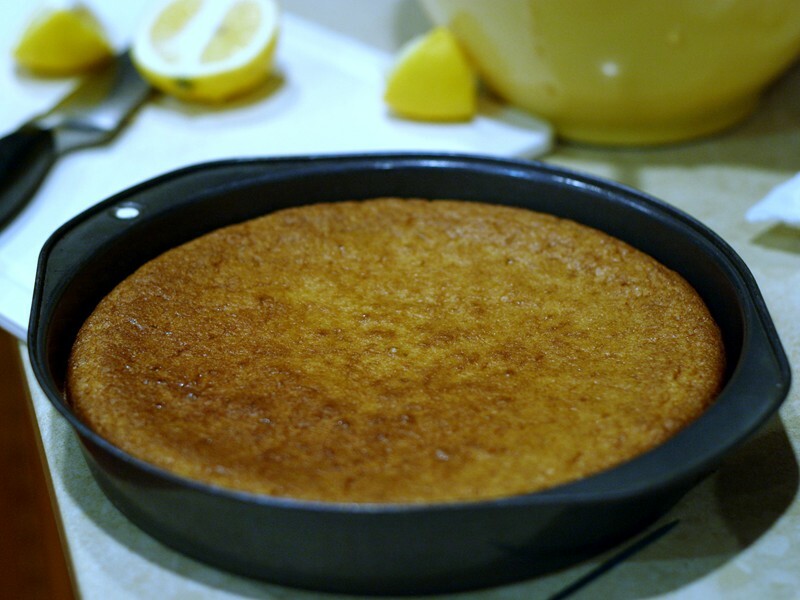 Also if you’re looking for a more simple yellow cake that does not rely on egg whipping and is a not spongy/airy, try this one. Update Many have asked for the chocolate frosting recipe so I added it to the bottom of this post. Updated on 12/12/12: Removed the step of oiling the sides of the pan. Updated on 11/4/12: Changed the amount of vanilla extract to 1 tablespoon. 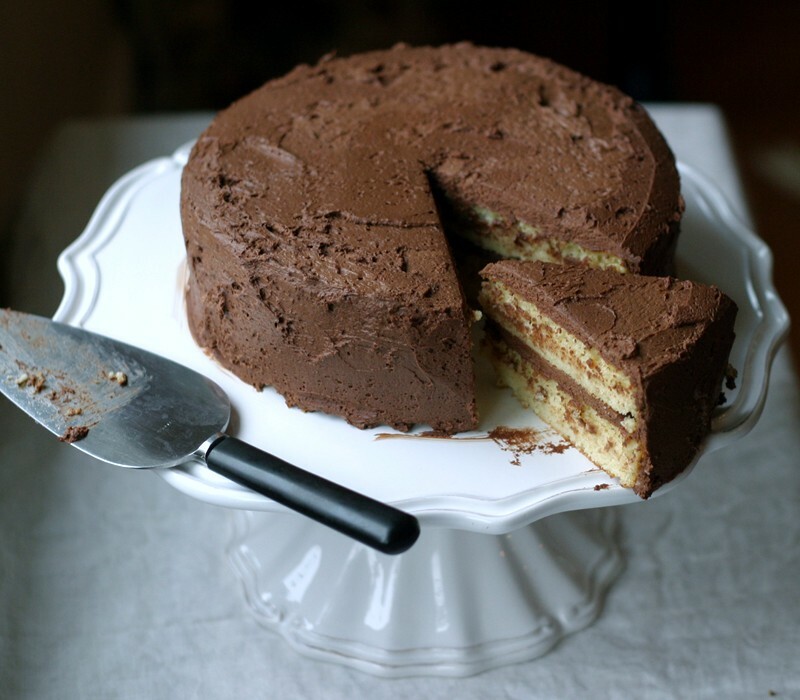 This tip from Mila in the comments section is great: Use a spring form pan, line the bottom with baking paper as suggested, but do not oil the sides so that the cake clings to it and rises higher. When the cake comes out of the oven, invert it on the pan so that it can maintain its height during the cooling, then run a sharp knife around the side and release from the pan when the cake is completely cool. Preheat the oven to 325°F (175°C or gas mark 4). Prepare an 8 inch spring-form pan (or a round cake pan) with a circular piece of parchment paper to place on the bottom of the pan. This allows you to remove the cake from the pan without it sticking. To yield the circle size I need, I place the cake pan on a piece of parchment paper and trace a circle around the pan. Separate the egg yolks and whites. Place the yolks in a separate mixing bowl, and then beat the egg whites with the vinegar until it’s just starting to get bubbly and soft peaks form. Optionally, when the cake comes out of the oven you can turn it over (invert it) in order to retain it’s height. Once the cake is cool run a knife along the sides to remove it from the pan. If you’re using a spring form pan, you probably won’t need to run a knife along the sides. Here’s my recipe for the chocolate frosting you see in the photos, using heavy cream and sweetened dark chocolate. You can use this recipe for ganache or whip it to get the texture that you see in the photos. The ganache is darker in color and you can pour or spread it over the cake while it’s still warm and then cool it at room temperature or in the refrigerator. Note: The frosting is not for those following SCD. Just the cake recipe above. Bring the cream to a soft boil in a saucepan and then turn off the heat. Add the chocolate to the cream and stir until all the chocolate is dissolved. Cool the chocolate mixture until it’s room temperature. The more you cool it the thicker it will get. You can also chill it for a few minutes. You can now pour or spread the mixture as a ganauche topping or go on to the next step to obtain a creamy frosting. For the chocolate frosting, whip the cooled mixture using a hand mixer or standing mixer with a whisk attachment. Whip for several minutes or until the frosting is light and creamy. Store sealed in the refrigerator for about a week. see the recipe I left one post down. Do you have a recipe for the frosting as well? I’m looking for a healthier frosting that doesn’t use powdered sugar. I don’t have the post on frosting together yet (busy couple of weeks here), but here my recipe for frosting using heavy cream and sweetened chocolate. I’m working on others without sugar, but until then. This recipe makes ganache or you can whip it, like you see in the pictures. The ganache is darker in color and you basically pour/spread it over the cake. Bring the cream to a boil in a saucepan then turn off the heat. Add the chocolate and stir until all the chocolate is dissolved. They cool it a bit – the more you cool it the thicker it will get. You can put it in the refrigerator for a while to cool it. To get the creamy frosting, whip the cooled mixtured like you would whip heavy cream. Voila! Do you think this would work with mimicreme for those of us who are dairy and soy free? Jennifer, I’m not familiar with minicreme. Yum! I’m going to try this right away. I was doing yellow cake with Elana’s Pantry coconut flour recipe, but 10 eggs is a lot for one cake! 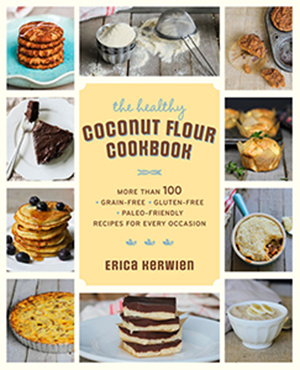 The reason why you have to use so many eggs is b/c of the coconut flour…it is so high in fiber that is absorbs all of the moisture. This recipe looks fantastic, can’t wait to try it! My mom and I are making the cake for my baby shower this May. We are going to be doing multiple “mounds” (think upside bowl) of cake, decorated, and laid out together to form a caterpillar. My husband and I don’t eat grains and sugar….so we LOVE your website and all of the almond flour recipes! I am hoping to make at least one of the cake mounds for my husband and I to eat. Do you think the cake batter will cook correctly in the upside down bowl shape? Also, I have not yet made any of the icings from your website. Do you think the consistency would work in cake decorating bags? Do you have any non-chocolate icing that we could tint with color that would work in the decorating bags? Thank you and LOVE your website!!! Thanks! It would probably work in the bowl shape. Yes, any frosting would work. My 13 year old daughter and I love your website. She made this last pm. The icing is in fridge cooling, will complete tonight! Looked delicious!! Was quite a project for her but she loves to bake and makes your recipes all the time (: The individual parts tasted great. She did the cream frosting. How long will the frosting last and is it best to freeze leftovers or store in fridge? I know the cream goes bad after a few days normally. Thanks! A chef/baker in the making you have there :). Yes, I store the cake in the fridge after it’s frosted. I made this last night and it tastes fabulous! Made the cream icying also. For one of the cakes it was extremely moist, and for the other one when i was whipping the egg whites they didnt get very fluffy, so that cake turned a little more dense, but they both taste wonderful with the icying. Love your recipes! I am going to try this recipe today. It sounds fantastic. I’ve been looking for a healthy cake recipe for my 3 year old son. Question: In your recipe, you have crossed out, beat whites until “stiff peaks form”, yet in a comment you recommend it. Would you please clarify. Thank you!! I’m going to have to retest this recipe – for now, just beat the egg whites until soft peaks form. Erica, this looks so good. Since I’ll have to try this, you just gave me a reason to bake a cake. Interesting that this recipe uses almond flour, and doesn’t need a million other types of flour. I generally stick to an all-purpose gluten-free flour exclusively since I don’t like mixing different types of flours. I think I have to try this recipe. Thanks! Yes – that’s what I like about almond flour. Best wishes. I have recently had to radically change my diet to try and help with pain management. It has been a big change for my whole family, my husband decided to eat the way I am to be supportive ~ I made your cake tonight, icing and all, my husband actually wept he loved it so much! Thank you so much, it was outstanding and will be a regular feature in our home! I am going to make one for a gluten free friend too. You brought a great deal of joy and yumminess into our home and we are filled with gratitude. That’s so kind – thanks for passing on all your gratitude! This looks so good Erica! I have been tinkering with a similar recipe, but I think I’ll just wave my white flag and use this one 😉 MMMM! Thanks Katie. Would love to hear about your version. Also, spreadable honey makes a nice frosting, or do without frosting and fill the cakes with jelly between the layers. Hope that helps! I emailed vegan Chef Chloe about my quest for an SCD frosting and she suggested cooking down coconut milk with honey and desired flavorings and agar agar flakes, cooling it, then whipping it w/a food processor. anybody make this as cupcakes to know the baking time? For topping I mixed a can of drained cherries and a can of drained pineapple together and spread it on. My family and friends enjoyed it very much, and it was easy! I made two cakes – one with almond flour and one with wheat flour. When the wheat cake was gone I brought out my almond flour one and people said that it was better – lighter and tastier – then the wheat flour one. That cake looks fantastic! I’m amazed it’s just almond flour; I have a good deal of experience of baking with almond flour but I don’t think I’ve really made any fluffy cakes with it. I’ll need to try this one. Re: cooking down coconut milk with honey, depending on how far it’s cooked it becomes a sticky substance similar to taffy and it sets very quickly as it cools. It’s actually a very good caramel or butterscotch base. Also, correct me if I’m wrong but I was under the impression that agar agar, in any form, was not allowed on the SCD? the fluffiness results from the whipping of the egg whites. I’m a baker with quite a lot of experience with cakes (grain based) and just recently went grain free at home. I wanted to see if anyone else thought of separating the eggs, whipping the whites to stiff peaks, etc because I didn’t want to use a mix of flours. The only other suggestion I would make: use a springform pan, line the bottom with baking paper as suggested, but do not oil the sides so that the cake clings to it and rises higher. When the cake comes out of the oven, invert it on the pan so that it can maintain its height during the cooling, then run a sharp knife around the side and release from the pan when the cake is completely cool. I don’t mind at all. I’m making this tomorrow because I am dying for cake and haven’t had any since going grain-free. With all the holiday baking I’m doing for my business, the temptation is becoming a little overwhelming. Thank you for posting the first recipe that I’ve encountered that looks like it will work out AND taste good. Sorry about the agar agar, I should’ve caught that. I actually tried this and used xanthan gum instead. It created a pudding-esque frosting. You are gonna save our Easter with this recipe. We are just barely switching to SCD and your blog is such a rescue to us in this difficult transition. Thank you. So far the SCD frostings I’ve tried have a pretty strong honey taste, which is not surprising, since they are honey based, but I’m not a big fan of honey myself. I don’t know how to make recipes, just follow them, but I’m trying to find a good frosting recipe that doesn’t have an overpowering honey taste, and on the SCD, that’s gonna be hard. We LOVED this yellow cake though! forgot to put the link… LOL…. Do you think I can leave out the honey and substitute splenda/stevia instead? I imagine you could, but I haven’t tried it. Honey provides extra moisture to the batter, but this is a very moist batter, so it might work. Maybe a liquid form of stevia? Do you know if I could replace any of the eggs in the recipe? I don’t. Sorry. Let us know if you try something, like bananas, flax, or egg replacer. I make this cake all the time! In fact, I thought of it when I got my new issue of Martha Stewart Everyday Food and there is a recipe for Maple Walnut Cake with Brown Sugar Frosting. I want to make it for Thanksgiving, but obviously a much healthier version. I figured I could substitute maple syrup for the honey and add walnuts to the batter, but I’m at a loss for the frosting. I don’t want to use regular sugars. I was thinking some sort of cream cheese frosting with added maple syrup. Do you have any ideas? suggestions? mine turned out good, but really spongy, and doesn’t look like yours at all. You had specified oil, I used spectrum.. but that might not have been the best choice at all. Still tasty, just texture funky. ??? it is a bit on the spongy side (air pockets due to whipping the egg whites). Spectrum might be lighter than other oils, maybe? Not sure. I made this cake with water-oven, I baked for 25 minutes and still sunk so i baked more 15 minutes and little bit wet so i baked again 10 minutes :)) and it’s perfect. So glad you were patient! I often use my convection setting but forget to mention that. It speeds up the baking process a bit. I haven’t tried those subs, but it sounds like they don’t work. Does spongy mean the cake is bad? I need to know before I serve it to guests….It looks great just springy ,spongy?? Thank you for your time. What kind of oil do you use? Would sunflower oil or olive oil work? Could butter be used in place of the oil? yes, any oil. And yes to butter. I just made this tonight and substituted pure maple syrup in place of the honey (since I am making this for my daughter’s 1st birthday) and mine didn’t come out looking at all like yours. I don’t think I cooked it long enough (cooked for 22 minutes at 325F) because it came out really flat and a little gushy in the middle. Any tips on what I might have done wrong? It is a little on the flat side and a bit finicky at that. Yes, you need to bake it longer if it’s still soft in the middle. You could try increasing the temperature to 350 degrees F. Everyone’s oven is a bit different. Hope that helps. This is a *wonderful* recipe! I used coconut oil (melted)- adds a great subtle flavor – and coconut crystals as a sweetener (reduced to 3 tbsp and it was plenty sweet. Next time I may reduce to 2 tbsp and see how that tastes). Since we’re using it for strawberry shortcake it doesn’t need to be real sweet. 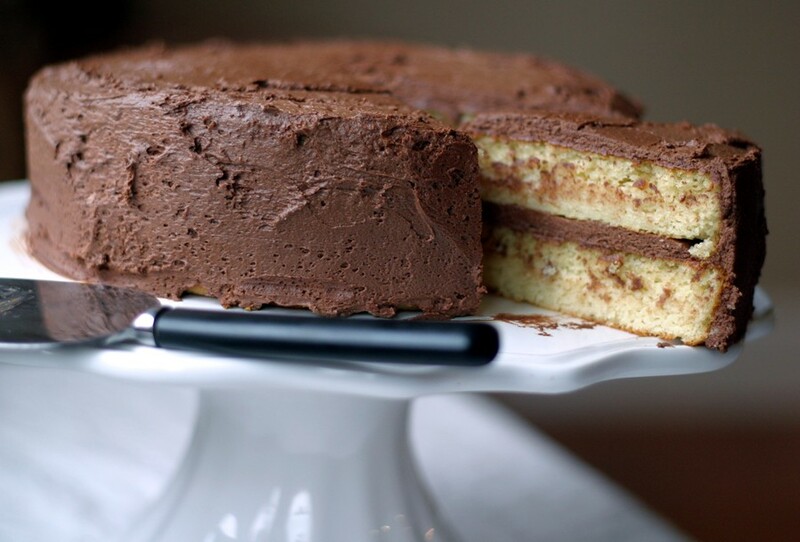 This cake has a wonderful texture and it very moist. I want to try coconut palm sugar as a sweetener soon! Thank you so much for sharing this! Thanks. love the idea of coconut crystals. Yes, it goes great with fruits that bring some sweetness to it. Thanks for asking. This is something that I’ve been meaning to experiment with, and I suspect you could replace the soda with baking powder in many of my recipes. The reason I don’t use baking powder in recipes, so far, is that baking powder contains at least one ingredient that is not allowed on the SCD diet. But I have been meaning to experiment with baking powder versus baking soda. Both baking soda and baking powder are leaving agents, that when added to baked goods cause them to rise by filling the batter with carbon dioxide (it’s a chemical reaction with the soda or powder and an acidic ingredient in the batter that produces carbon dioxide). Baking soda is a pure chemical, sodium bicarbonate, while baking powder is a combination of baking soda plus an acidic and a starch. It’s the starch that is not allowed on the SCD diet. So baking soda is bitter (more alkaline) while baking powder is neutral because it has both an acid and a base in it. Hope that helps! 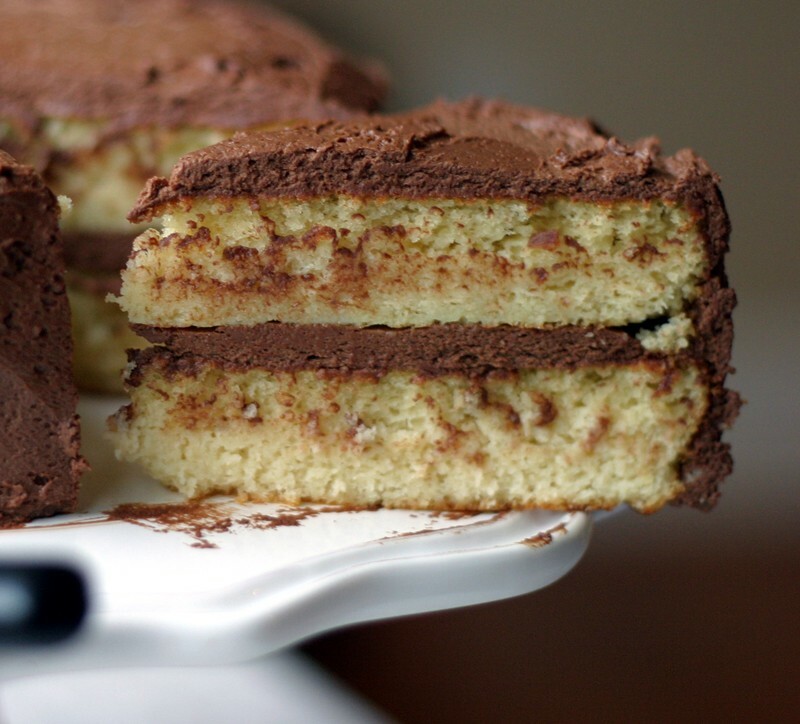 Thank you so much for sharing this delicious cake recipe. I made it yesterday for my daughter’s birthday, her 29th. Everyone loved the cake. We’re a mix of GF, Paleo, and SAD diets. 🙂 I frosted it with your Chocolate Whipped Cream frosting. Yum! Love this cake. It will be served as my 1 year olds 1st birthday cake and smash cake. It is amazing. We have been GF, cf for a few years. Recently we went gaps and I finally gave up all the store bought treats. It’s so difficult to make GF cakes. They always lack in fluff usually so dense you would rather play kick ball with them then eat them! Not this cake. I’m going to pin it, fb it, chef app it, email it! Whatever I can to make sure I always have it. Thank you!!! So for those needing feed back my cranky teen daughter who refuses all cake (store bought or home made), brownies, fudge, cookies (except chocolate chip) but loves treats said this is the first cake she has ever liked! My picky 10 and 3 year old inhaled it as well. Used the spectrum shortening recipe to frost. Was perfect!!! wow, that’s great Angie! Yes, lemon, lime juice (or even vinegar) will work. Something acidic. Oh! I was out of lemon so I used lime juice. Thanks for this recipe– it’s PERFECT! I’ve been attempting so many paleo/primal treat recipes lately and failing to find one that tastes good. The texture of this cake was spongey and light and perfect for what I was looking for. Thanks!! I’m attempting to make cake pops from this so fingers crossed! If that doesn’t work out, at least I got a great recipe from you! Fun! Yes, I think this will work well because it will absorb the jelly and mold well. Good luck! I suspect all the cake recipes will work. I’ve been making lots of swiss buttercream frosting for all of your yummy cake recipes. I just convert Martha Stewarts recipe to use honey instead of sugar (1/2 as much honey as sugar called for) for the meringue, then add in lots of unsalted butter. You should try it 🙂 Scd legal when vanilla, GAPS legal when chocolate. So glad I found your website! My question is: being that I’m diabetic, can I substitute almond meal instead of almond flour for the recipe? Almond meal is flour ground from almonds with their skins in tact. Almond flour has the skins removed. I don’t think it would make a difference as a diabetic to use either, but this recipe is really mean to be used with almond flour. Almond meal will probablyy work, but it will taste a bit different. hope that helps. Just read the recipe again and realized it says just oil. So I guess I will melt the coconut oil. Yes, melt it. I edited it to be clear. Thanks! Just finished making this cake, it turned out wonderful. I’m not completely sugar free, so I did chocolate frosting with coconut oil, cocoa, and powdered sugar, vanilla and coconut milk. My cake rose as yours, but not the same color. My cake is beige, which I don’t mind, just wondering how your cake is white? Thanks for such a great cake recipe. Hi Amanda. Thanks for sharing all your changes – you know I love to hear about them :). I’m a serial changer myself. My cake has been more beige as well. I took these photos a while ago and I’m not sure why the cake appears more yellow then than it does when I bake it now. But you’re not alone. Enjoy! Made a version of the cake tonight for my mother, sister, brother in law and nephew. It was a huge success. They all couldn’t get over how moist and fluffy the cake was. I only had 9” pans so my cake came out a little thinner than your picture above. My family loves coconut so I made a coconut cream cheese frosting instead of chocolate. Thank you for the wonderful recipe and I will be making this cake and variations of it for years to come. Off to the kitchen for round 2 before bed!!!! My cake turned out spongy, looked nothing like the photo. Lol. Maybe I did some wrong, and it had not height to it. I used the correct amount of ingredients I double and triple checked. I really have no luck when it comes to cooking with almond flour. Help please! Do you know what might have went wrong? To solve the problem of frosting a soft cake, i would freeze my cakes and frost them frozen. By the time you serve it it will be thawed and room temp! I learned this during my cake decorating classes with Wilton. Looking forward to making cakes again. One question – what could I use for the honey? I need to watch my carbs. Yes – definitely cool and either refrigerate or freeze the cake for a bit and then frost (and frosting at room temperature as well). Hmmm, honey is tough. Maple syrup isn’t much better. I guess Agave, but I don’t use it or recommend it. Some use stevia liquid or mixtures. Also take a look at my yellow cake using palm sugar. I am going to make this as an Easter cake for work and place small chocolate Easter eggs all over it. They will love it. Looks delicious. I will use Elana’s Vegan Chocolate Icing though as I am lactose intolerant. Hi,I tried your recipe.ıt’s deliceus.thank you. How did you do its chocolate? 1) I doubled recipe to have two 8″ pans & took your advice to not grease sides. My dad used to make sponge cakes while I grew up in his bakery and I remembered that tip. Thanks for making a note of it to remind me. I doubled the vinegar measurement, but do you think I could leave the 1 tsp for 6 whites? I didn’t taste cake yet. Looks light & spongy & cake rose nicely. 2) On step 6, it says to fold in whites but then whisk in almond meal until well mixed. Usually after whites folded you don’t want to whisk to “deflate” the air of the whites folded in. So should it be the almond meal put in begore with wisk or just fold in like the whites? Sorry to be so technical, I just want to make sure it’s OK in case somebody else might over mix & their cake didn’t rise because of it. I just folded mine in. Looking forward to a flourless & refined sugar-free cake!! Thanks for a great site to refer to. Not sure what to say except that I know the picture is a bit lighter than the cake, in general, and this is not a high-riser. I haven’t made this in a while but from my memory each 9 or 8-inch half is about 2 inches high. I recommend my recipe testing yellow cake or even better, the yellow cake in my new book. I’ll probably be putting that same recipe in my next book as well since it uses both almond and coconut flour. Sorry had trouble. Hope that helps. I just recently started on the scd diet due to SIBO and love your website. I also purchased your book. Spring form pans are quite nice in that the sides come off of the pan. I think I adding one to my Amazon shop you can take a peek at to get an idea. In any case, I just edited the method to try to clarify what invert means. It was a suggestion from a reader that I added. You basically flip the pan over when the cake comes out of the oven and let it cool like that in the hopes that the cake will not sink in the middle. Hope that helps. Btw, my yellow cake from book is way easier to make and more reliable than this cake (and lighter) since it’s a mixture of almond and coconut flour. I much prefer it. Best wishes! I tried this recipe today, and it is so good! Moist and delicious! Thanks! HOLY COW i made the cake (used different recipe for frosting) and it is AMAZING! even for goofs like me that got a tiny amount of yolk in the white mixture so it didn’t peak at all- still turned out to be the best paleo cupcakes evar! i love you and hate you at the same time. thank you! Thank you so much for this outstanding recipe!! We and all of our friends are addicted. I double the recipe and bake it in a 9×13 pyrex. When it’s done, I cut it in half, add a chocolate filling between the layers, and frost it with homemade strawberry jam. Just before serving I top it with fresh whipped cream. It’s to die for! Thank you!! I can’t wait to try more variations and toppings. I made this cake for my husband’s birthday. I completely forgot to mixed in oil but still turned out tasty. This cake is outstanding!! My moms birthday cake of choice and I didn’t think I could replicate it, but this was awesome. Thank you! Fantastic cake! One of the best SCD friendly baked goods yet! I made chocolate buttercream icing sweetened with honey- delish! Thanks, Ami! Good to hear it went well! Can you substitute with vinegar? Do you think this recipe for the pound cake would suit a tiramisu recipe? Is there an alternative to eggs ? Yes, subs for eggs are banana and applesauce but there’s nothing for binding flour like eggs. There are also egg replacers. Just a tip – I used a non-strick spring form pan with no oil or grease or butter. Still when I inverted the pan (as suggested above) the cake fell right out – and landed on the cooling rack – thereby losing height.SO beware – next time I’ll leave the pan upright till it’s cool. I made this cake yesterday! It was delicious. I used maple syrup instead of honey to avoid fructose. The texture came out great! I really wanted chocolate frosting but I don’t have an electric hand mixer, so once the ganauche cooled down I just added some cream cheese to it and that made it very easy to spread and very yummy! Thanks for the recipe! I will use it again for sure. would I change this if I wanted to make cupcakes with this same recipe. I haven’t tried it yet but you wouldn’t change anything other than the baking time. The cupcakes may be done about 5 minutes sooner.